One Knot – 240 Metres of Rope – 2,200 Crossings – 3 Months Work! Celtic knotwork has fascinated me for over 30 years now. It has always been drawn, painted, etched and carved etc., so I set myself a completely new challenge to tie the longest Celtic knot I could. And to my knowledge, nothing like this has ever been done before. Although this type of knotwork is labelled Celtic, it really has roots in all cultures around the world. “House Of Ancestors” is tied around a handmade wrought iron frame into one single parallel knot using 785 ft (240 m) of 1/4” (6 mm) cotton rope with no joins. The overall size is 48” (122 cm) wide by 72” (184 cm) tall. It crosses itself approximately 2,200 times and starts and finishes at the bottom in monkey fists. But the most interesting thing about the whole process (that I realised after a few months) was that it mimics real life. Everybody is unique – the decisions you make from day one always have a consequence later on, so when you turn left, right or go straight on, when eventually you come back to that point you will have to deal with that former decision and deal with it. So every hanging is different. In something this large you have 2,200 decisions, so the permutations are endless. When you start you’re tying in ‘mid air’ it is very easy to make a mistake at this stage. If you either go under or over the wrong way, or turn at the wrong point, mistakes will probably only make themselves clear once you’ve completed most (or all) of the panel – after a very long time, so concentration is zen-like – for months!!! Also, handling all that rope is a logistical nightmare – it always wants to twist and pull everything out of shape. We cut the edges off of two boards in order to join them together. It makes for a really interesting game! Six kings each to start and win by triple capture (although that’s not the primary objective). Red wins this game with the fewest kingdoms. Red passed as all the kings (both Red and Blue) on the board were immobile and because Red deemed there be no benefit continuing. Note the upturned ringfort on bottom right. This was placed by the first player to produce an odd number of hills, so preventing a territorial draw. This acts as another ‘border’ within the board, so making internal edges etc.. Placed near the corner like that produces two hills that can be individually besieged by just one enemy ringfort. OUR FIRST WORLD CHAMPION COULD BE YOU ! The inaugural Tara World Championships will be held during the Clonakilty Games Festival on the 8th and 9th February, 2014 in the back of DeBarra’s Bar in Pearse Street, Clonakilty. Saturday 8th: 11.00 – 17.00 Come, learn and play with one of our friendly volunteers. Saturday 8th: 13.00 – 17.00 Tara – Four Treasures World Championship. Sunday 9th: 12.00 – 17.00 Come, learn and play with one of our friendly volunteers. Sunday 9th: 13.00 – 17.00 Tara – Sacred Hill World Championship. Prize: Perpetual trophy plus Collector’s Edition game worth €250. The championships are open to anyone to enter. Just make sure you are up to date with all the rules please. Help and advice will be available at all times. PLEASE register in plenty of time, at any time prior to the particular event with your name, email address and telephone number, or by emailing me at [email protected] with the same details. Up to date rules for both games are available on this website, but please note that we shall be using a modified transition rule from Manoeuvres to Battle in Sacred Hill which states: “Once the first player proceeds to Battle and plays, the other player also proceeds to Battle immediately afterwards (there is no longer a requirement to make one extra Manoeuvres turn)”. This will shortly be updated on the website for both Sacred Hill and High Kings of Tara. Come and learn how to play Tara (or improve your game). After the Clonakilty Games Festival I had so many people ask me if there was something more regular, so I’ve arranged the upstairs room at the Aris Cafe, Astna Square, Clonakilty, West Cork, 7pm – 10pm, last Friday of every month. Entry is free, but please show your appreciation to the Aris Cafe by grabbing a coffee or whatever you like for their great hospitality and welcome. Those 13 and under MUST be accompanied by a parent at ALL times. The first meeting is Friday 28th February. Bring your friends too! Thank you to all those who came down last Friday to the Tara Club in Aris Cafe. We had a great time – and the room is perfect – and we had a great welcome from Aris Cafe. We all felt that perhaps Friday wasn’t the best night for it, and Thursday might be better for everyone. Also, twice a month was talked about. But we’d really, really like to hear your suggestions too please! So let’s build on what we started at the Games Festival and see you next time. Thursday 27th March is our favourite and first day we can do a Thursday. Also, Friday 14th March is a possibility too, but please let us know. Intended for the original deluxe Tara board which was started to be made in granite, then either gold or silver leafed! There were two elements and four of each – the edge and corner pieces. They were drawn in such a way that enabled them to be coupled with either their own kind or the other and ensured that all the knots and animals etc. 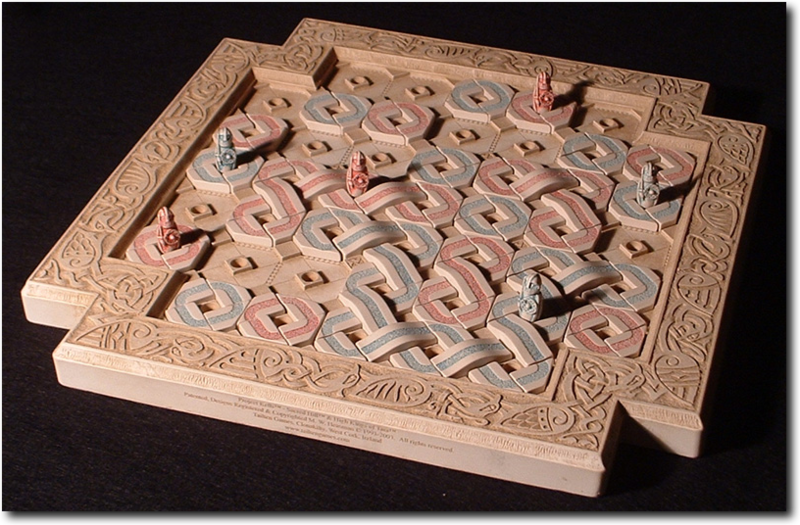 continued logically within the knotwork constraints, so that numerous boards could be added together. Unfortunately, this 44 hill layout of board was superseded by the current 45 hill board.